Nigeria is not and will never be a country for justice and equity in Africa, let alone in the world. There are many evil plans which the Nigeria Hausa-Fulanis and their Yoruba counterparts have planned against the innocent Biafrans both at home and abroad. They have concluded plans on how to suppress Biafrans and make sure that we felt the agony of life during the massive movement of many Biafrans to their native homes in celebration of Christmas. And, Muhammadu Buhari, the incumbent Nigeria president is living up to the expectations of his Islamic cohorts. Many Biafrans who are travelling to Biafra land from other parts of Nigeria have been subjected to unimaginable harassment, torture, extrajudicial killings and high ranking intimidation by Nigeria security agents, as ordered by the government of Muhammadu Buhari. The Nigeria policemen, custom and the road safety officials stationed on the highways have all turned out to be criminals. 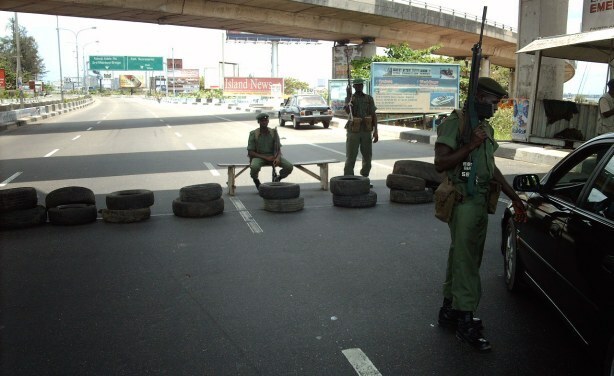 They had mounted heavy blockades across the roads so as for vehicles to slow down on the spot. They have been using this method to steal from this travellers their money and properties. These innocent travellers will toil in their various businesses from January to November, and only for the fruits of their labour to be stolen away from them in December on their way to their various homes in Biafra land to see their families whom they left for a long time. Until all these are stopped, and Biafra is let go, Nigeria shall never no peace. Why are the Nigeria police officials stealing money from our people who are travelling? Why are the Nigeria customs personnel seizing and taking away food items from these innocent Biafrans? Why are Nigeria road safety harassing people on the highways when no one agrees to give them the money they demanded? Have you seen that Nigeria, led by Muhammadu Buhari has an evil agenda to accomplish which is to suppress and suffocate the lives of Biafrans. On the 24th of December 2016, a newly married young Biafran man who travelled all the way from Indonesia for his wedding at Oweri Imo State, Biafra land, was shot to death just three days after his marriage by the Nigeria police for nothing sake. What crime did this young man committed that lead to his death, and what do you think that could be the fate of his partner? Remember that all this are what Biafrans goes through in Nigeria. We have earlier said that Nigeria is not our country and Buhari is not our president. The fact is that we didn't just wake up one morning and denounced Nigeria, we put many things into consideration before we were able to denounce Nigeria totally. In every country of the world, human lives are considered first; but in Nigeria, animals lives are considered first before humans, especially when it comes to the case of Biafrans. The way Biafrans are being maltreated, tortured, intimidated and then massacred in Nigeria has gotten extremely worse. Why should we be treated in such a way, are we not humans? The world leaders must take notice of this and separate Biafrans from Nigerians to save innocent lives and properties, because we are not united in any way. Kerosene can never mix with water, Biafrans are not Nigerians, therefore we must not continue with the fabricated and concoted one Nigeria citizenship. Biafra is our country and we must restore her sovereignty by any means possible. We shall never give up or surrender until we get to our promise land, Biafra. Please, I plead the world to intervene to every day atrocities Nigeria government are committing against we BIAFRA'S. Please If you really want to know exactly what is going on in the BIAFRA land, please don't have any contact with all those murderers that occupied all the government seats, kindly contact the poor masses in BIAFRA land, then, you will get real truth of oppressed, open killings and secrets killings which is happening now in the BIAFRA land. Thank you for urgent intervention, there's so many illegal forces without official number and uniforms, and also with forces with uniforms which un-identify, who are maltreating, killing, oppressing innocent citizens of BIAFRA, because we are not Nigeria, because Nigeria doesn't want us for over 46 years ago, they are handling us More than sleeves, we have more than enough evidence for the world, don't delay any more for rescue of BIAFRA. We have said goodbye Nigeria-boko-haram/Hausa-fulani.